I just read this article and thought you might want to give it a read, too. It\'s called 7 best bleisure travel hotels that perfectly mix business with pleasure and you can find it here https://www.orbitz.com/blog/2018/07/7-best-bleisure-travel-hotels-that-perfectly-mix-business-with-pleasure/. The term may not quite roll off your tongue, but “bleisure” travel — the mixing of business and leisure travel—is on the rise. 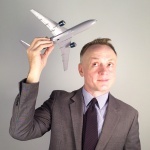 Corporate road warriors and even those of us who travel just a few times a year for meetings or conferences, will likely find ourselves in pretty interesting places on the company dime—so why not extend the visit and have some fun once the work is done? 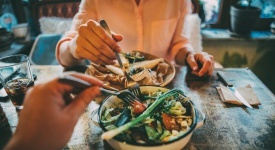 To accommodate this growing trend, savvy hotels have made it easy to combine business with pleasure, offering an array of on-site amenities that help business travelers stay productive, while also providing lots of leisure time activities. Add a good location close to attractions and these are the perfect hotels offering the best of both worlds. 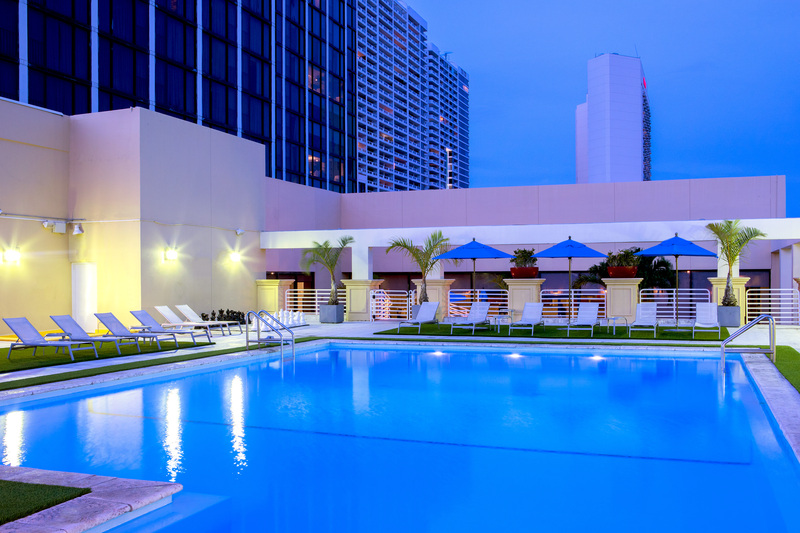 The pool at Hilton Miami Downtown, at dusk. Thanks to a recent $45 million renovation, the Hilton Miami Downtown has refreshed its extensive meeting and convention space, as well as guest areas. The clean, contemporary style provides an attractive backdrop for the culinary offerings at Brisa Bistro restaurant and 1601 lobby bar, while the terrace pool is the perfect place to sip a cocktail after a long day of work. The free Metromover public transit system, adjacent to the hotel, makes it even easier to explore the dining and shopping in downtown Miami. And Miami Beach is just three miles away, making for an easy escape. The recently renovated Kimpton Hotel Monaco Denver is ideal for mixing business with pleasure for a variety of reasons: Business travelers can make use of 4,000 square feet of well-appointed meeting space and also take advantage of the hotel’s proximity to the Colorado Convention Center. 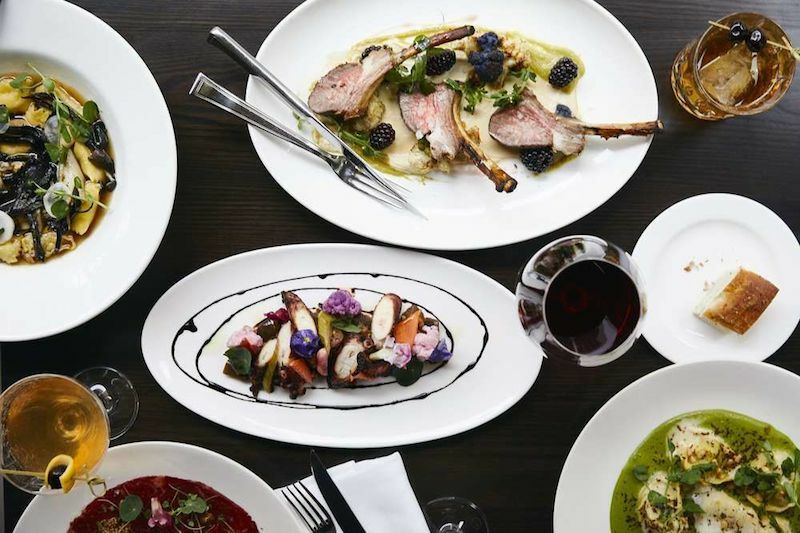 Once work is done, savor tasty Italian creations at the hotel’s award-winning Panzano restaurant, or stroll over to the many craft beer bars and restaurants in downtown Denver. The hotel even loans out free bicycles, to help you stay in shape as you wander. 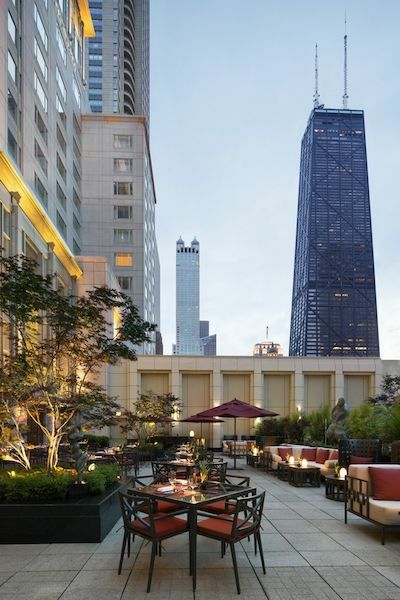 This luxurious Chicago icon is designed for indulgence, and for taking care of business. At the Peninsula Chicago, meet with associates in one of eleven meeting spaces, then pamper yourself with Asian-inspired treatments at the Peninsula Spa, which sits on the 19thand 20thfloors. The sun terrace and indoor pool are especially scenic places to relax while enjoying postcard-perfect views of the Chicago skyline. 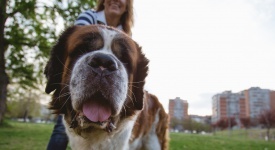 The property also offers a Keys to the City program, which provides access to “only in Chicago” experiences like VIP passes to the Art Institute of Chicago and the Field Museum, plus private helicopter tours and private shopping trips to Saks Fifth Avenue. 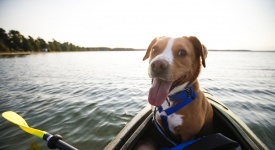 ALSO: Stay just a little bit longer when join Orbitz Rewards—it’s free! 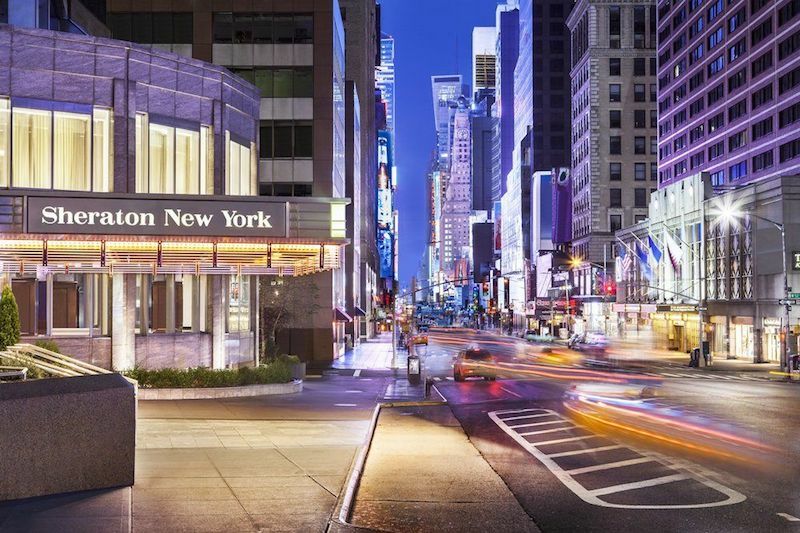 This hotel’s central location in Times Square puts business and leisure travelers right in the heart of the Big Apple. The Sheraton offers easy access to countless midtown offices and businesses, while onsite you can make good use of the 24-hour business center and 60,000 square feet of meeting space, including an Executive Conference Center that’s ideal for small groups. Entertainment is never more than a few minutes away, with Broadway shows, the NatGeo Discovery Center and the NFL Experience nearby. 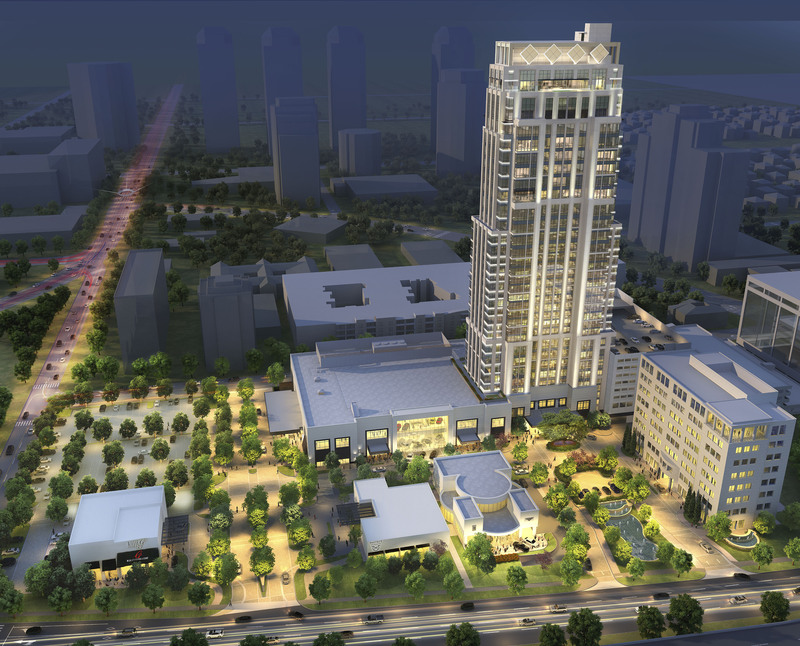 A rendering of the new Post Oak Hotel at Uptown in Houston. The stylish new Post Oak Hotel, which opened in 2018, is situated inside the Galleria—the largest shopping center in Texas. That means you’ll find office space, fashionable shopping and upscale restaurant offerings, all in one place—perfect for a business trip that’s complemented by luxurious indulgence. There’s even a two-story Rolls Royce showroom, in case you feel like picking up a new ride. The hotel’s swimming pool, fitness center and spa satisfy the needs of guests looking to relax, while the business center and 10,000 square feet of meeting space are available for work time. 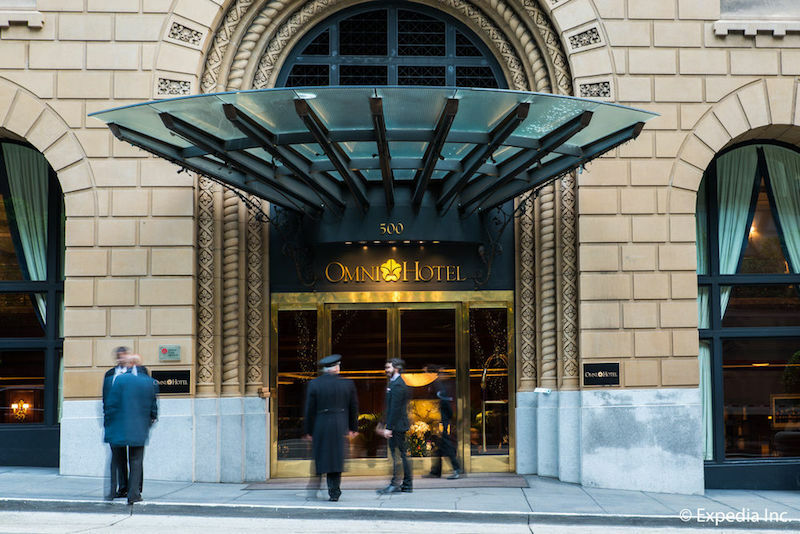 With its 11,600 square feet of meeting space, 24-hour business center and prime location at the corner of California and Montgomery Streets, the Omni San Francisco is well equipped to handle the needs of busy road warriors. 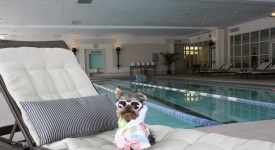 This luxurious San Francisco hotel is also perfectly situated for after-work leisure activities. Guests can sign up for free guided walking tours of the city, work out in the 24-hour fitness center or jump on the legendary cable car, which stops right outside the hotel door. The property even has an Omni Kids Crew children’s program, which provides kids with a backpack filled with goodies at check-in. The Westdrift Manhattan Beach hotel overlooks a 9-hole golf course. 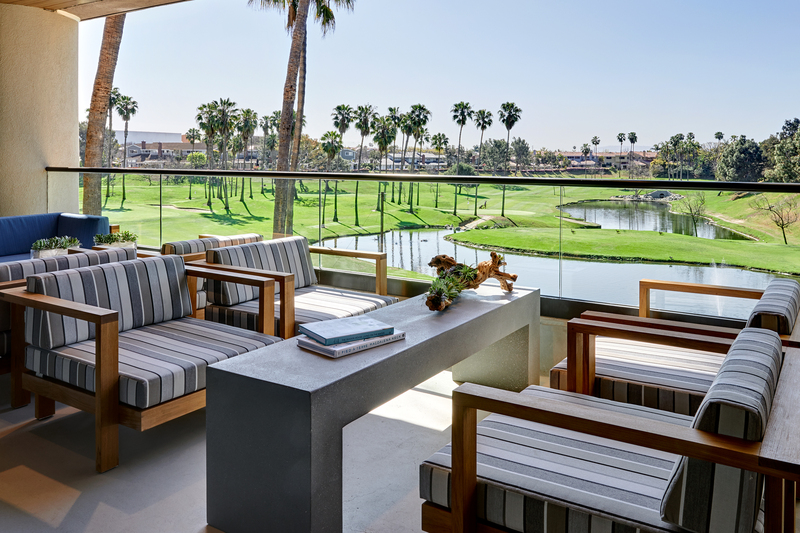 Part of the Autograph Collection by Marriott, this 26-acre southern California hotel is supremely accessible, sitting less than a mile from LAX airport. The Westdrift‘s 35,000 square feet of event space includes 18 meeting rooms and three “industrial chic” event venues. Once the work is wrapped up, it’s easy to slink over to the large pool deck to claim a spot in a wood-framed cabana, or test your skills at the hotel’s 9-hole golf course. The hotel is just a block away from Manhattan Beach’s top shopping, entertainment and dining venues, and a mile away from the beach.